Test brunch at Nha Vintage House | eat me! Today my dear son was my co-admin and help-tester for a new place in town. The graciously had invited the admins and several members of the Foodies in Hanoi facebook group to generate some buzz for this new place. In general a very good idea. Julius was adventurous enough to try everything (nothing really exotic or scary there) and other guests found it very cute that I brought a 10 year old to such an event. 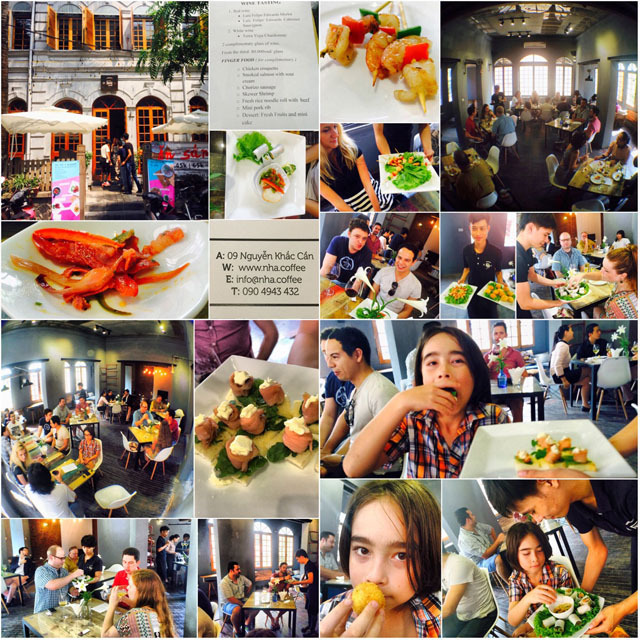 As for the food … I want to be polite here and hey it was free … but it is not really a ‘foodies’ kind of place … it appears to be geared towards the more affluent ‘hip’ young Vietnamese who want to take selfies with ‘exotic’ European style food and expensive ingredients like salmon and shrimp. The spring roll cuts we had were rather bland, as were the chicken croquettes, the presentation of the chorizo was just weird, it looked like a salad / garnish, the salmon was very good, but it looked a bit funny when apparently they used salmon from 2 different packs and they had very different colors. From what I saw, the drinks are rather pricy. Actually, what really pops out is that none of the things we ate are actually on their menu! I had hoped that the ‘share one main’ could have been the ‘plummy duck’, but that main-share never happened. So, after this tapas event it is really hard to say how their ‘actual’ food is.